Hey there, Sad Mario Horse. How you doing? OK? You look a bit down. Is it because a human being dressed you up like Mario? Yes, I agree that it is a bit degrading, but you do have to admit that it is also pretty funny. Look at that little hat you're wearing. Look at those little suspenders. Hell, they even went to the trouble of putting a tiny mustache on you. 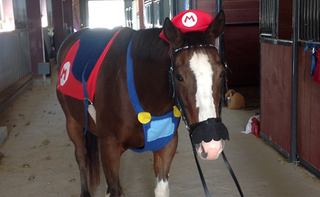 You gotta admit, Sad Mario Horse, it's all pretty adorable. What's that, Sad Mario Horse? You have something you want to say to us? I think we both know why, Sad Mario Horse. I think we both know why.